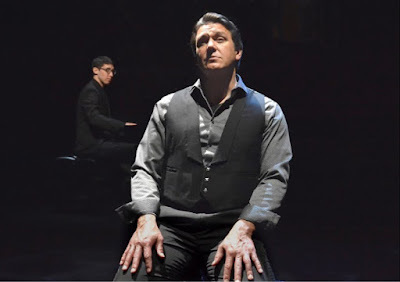 Carol's Theatre Reviews ~ It's Fun To Go Out: Nathan Gunn’s “Flying Solo” Finds A Home At The San Diego Rep.
Nathan Gunn’s “Flying Solo” Finds A Home At The San Diego Rep.
Hershey Felder is no stranger in presenting self-creative solo productions to theatres throughout the world. Over the years San Diego audiences have been privileged to see him as George Gershwin (Alone), “Monsieur Chopin”, “Beethoven”, “Franz Liszt”, “Lincoln: An American Story”, “Irving Berlin” and “Our Great Tchaikovsky” and I’m just tipping my toe into the shallow end. 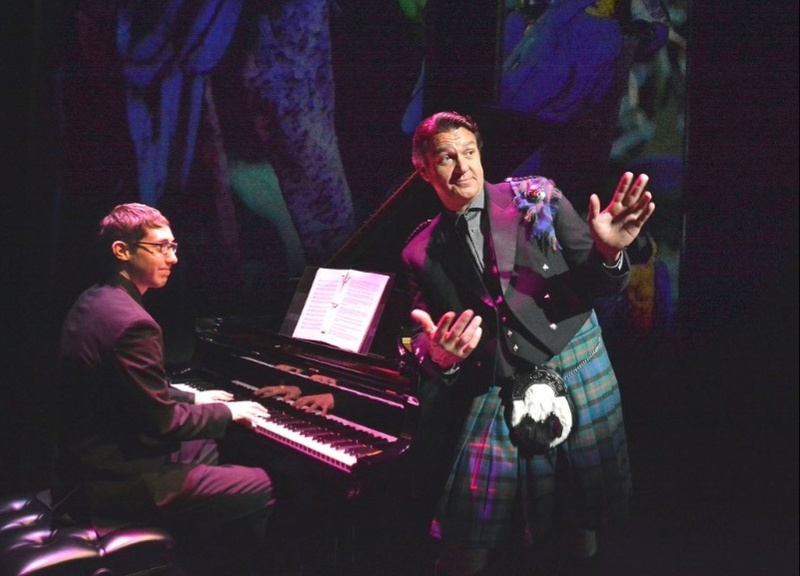 In recent years he adapted, directed and designed the internationally performed play-with-music “The Pianist of Willdesden Lane” that was brought back to San Diego by popular demand. Now through June 10th we are privileged to be thoroughly entertained by another of Felder’s original creations, a piece based on opera singer and baritone extraordinaire Nathan Gunn’s rise to fame in “Flying Solo”. Gunn describes it as “a semi-autobiographical one man show’. He’s charming, engaging, down to earth and oh! So talented. Gunn entertains us with “O What A Beautiful Mornin’” from Oklahoma, to the gorgeous soliloquy from “Billy Budd” to “C’est moi” from “Camelot” and in a fun duet with himself singing his Papageno from Mozart’s “The Magic Flute” when he performed it at the Met. in 2006. Forty something year old Gunn whom I had forgotten performed here in 2016 in Jake Heggie’s opera “Great Scott” (I then referred to him as ‘swoon handsome Baritone Gunn’) was somewhat of a forgotten memory. But as soon as he opened his mouth and began telling his story, his opera performances at The Metropolitan Royal Opera House, Paris Opera House where he performed leading rolls in “Billy Bud” and “Eugene Onegin” to Lincoln Center, Carnegie Hall and Broadway Shows he starred in, I was hooked. I spent most of the evening hanging on his every move, every aria and every show tune. Gunn’s story starts out on two tracks. He was always eager to please his dad who wasn’t always easy to reach on the one hand and satisfying his drive to sing opera, that was insatiable, on the other hand. And while the father/son relationship would always be a little tricky, he almost fell into his singing career by being in the right place at the right time. Born in South Bend, Indiana his one time focus was on football, where his on again-off again relationship with his father was always an issue growing up. As the only son in a strict Scottish family, his father was head and patriarch of the Scottish Clan Gunn there were expectations. Throughout the program, Gunn would refer back to things he did to impress and hopefully have a more kumbaya relationship. He was accepted to all the major music colleges and higher institutions but he chose instead to attend University of Illinois, because it was expected of him and it was tradition. As fate would have it, he met his wife while at college. The young couple moved to New York close to the Met. In Hell’s Kitchen after Gunn was on track to be part of and later winner of the Metropolitan Opera’s young artists development program, not to mention where the first of their 5 children was born. In this 90 or so minute bio/song fest Gunn easily brings us into his life with the use of projections by Brian McMullen and with lighting designer Richard Norwood (Hell’s Kitchen, Renata Scotto his performance of “The Magic Flute” with himself) and of course his giving us so many favorite complete arias and Broadway hits. 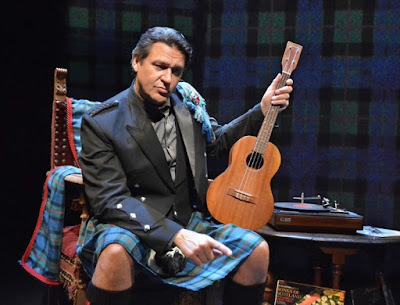 For an entertaining evening of entertainment with a charming young and beautiful (dressed in his native Tartan Greens; kilt and accessories) world acclaimed baritone, hitch your star to Nathan Gunn and “Flying Solo” by Hershey Felder.